Relations between Fiji and Australia have taken yet another turn for the worse with the revelation that Canberra has been secretly blocking Fiji’s access to hundreds of millions of dollars for development projects. A senior Australian academic – Professor Stephen Howes – told The Australian newspaper that the Government had used its muscle to veto loans to Fiji by both the World Bank and the Asian Development Bank. They would have been used to finance improved basic services for ordinary Fijians such as water, roads, hospitals and schools. Instead, Fiji was forced to turn to China to secure low interest loans and was also obliged under these contracts to use Chinese firms and Chinese workers. Professor Howes is Director of the prestigious Development Policy Centre at the Australian National University so his sources are presumably credible. And while an official Australian Government spokesperson responded that the two banks are independent institutions with their own decision-making processes, there was no outright Australian denial of the Professor’s claim. All of which constitutes more evidence that in spite of Fiji’s clear timetable for a return to democratic rule by next September, Australia is intent on crash tackling the Bainimarama Government at every turn. The hostility is even more remarkable when the relationship between ordinary Fijians and ordinary Australians remains warm, even affectionate, and the business communities of both countries maintain their cordial, mutually profitable ties. Australia keeps saying that it’s not targeting ordinary Fijians, just the Bainimarama Government, and has increased its Fijian aid program to more than $F100-million for the first time. But Canberra controls the purse strings and chooses the projects in a way that Fiji naturally finds highhanded, even offensive. “Not surprising” was the reaction to the disclosure of the loan veto by Fiji’s Acting Prime Minister and Attorney General, Aiyaz Sayed-Khaiyum, who added that Australian policy reflected its unwillingness to understand what was happening in Fiji. “Representatives of a number of developed democracies have confided to us that they consider the Australian posture unwarranted, counterproductive and not supported by the facts in Fiji”, he said. Those countries include the United States, some of whose diplomats, both in Washington and Suva, are confiding privately to the Fijians and others that they are perplexed by Australia’s continuing hardline stance. The Americans are clearly torn between their desire not to unduly offend their Australian ally in ANZUS and their increasing concern that Canberra’s intransigence is driving Fiji steadily closer to the Chinese. That concern can only have been exacerbated this week by the sight of the Prime Minister, Voreqe Bainimarama, hobnobbing with the new Chinese leadership in Beijing and becoming the first Pacific leader ever to be granted access to the very top. All along, Commodore Bainimarama has confounded the Australian attempts to dislodge him. And the more the Aussies bait him – it seems – the more he rubs their noses in the dirt. In a strategic sense, the Pacific has emerged as the setting for what some analysts fear could become a dangerous faceoff between the Chinese and the Americans down the track. China is already flexing its muscles and trying to impose its will on some of its neighbours such as Japan with a string of territorial demands. And while some commentators – who can be loosely termed the “doves” – insist that Beijing is only interested in promoting its commercial interests and wants to work in partnership with countries like the US and Australia to guarantee regional stability, others – the “hawks” – aren’t so sure. Just this week came yet another example of Beijing’s less-than-friendly attitude when it was revealed that China had hacked into, and compromised, Australia’s new intelligence headquarters in Canberra. That story hasn’t been officially denied. The “hawks” are especially concerned about the way in which Australia’s Labor Government has steadily degraded the country’s defence capability. One of them – The Australian’s respected Foreign Editor, Greg Sheridan – has described the defence wind-down as a “national disgrace”, He said that while Australia could still readily cope with an emergency in one of its island neighbours, it was now so denuded of appropriate weaponry that it was no longer able to contest a wider conflict. The Australians themselves, of course, are in a terrible bind. Their economic success and pampered lifestyle has just earned Australia the tag of “happiest western democracy”. Yet that happiness depends entirely on China continuing to buy Australia’s natural resources. Simply put, the Chinese have the Aussies by the vitals with a narrative that goes something like this: “While we prop up your economy, you will not only keep selling us your minerals and gas but will refrain from rattling your sabres in our direction”. Not that there seems much to rattle, if Australia’s more pessimistic defence analysts are to be believed. So China is free to make inroads in the region and that includes establishing a strategic beachhead in Fiji. By shunning the Bainimarama Government and cutting off its access to alternative sources of funding, Canberra abandoned its influence in Fiji long ago and smoothed Beijing’s way. How could the Australians have made such a major strategic blunder? The simple answer is that since Labor came to power in 2007, the country’s trade unions have largely dictated Australian policy towards Fiji. Acting in the interests of a handful of local union leaders, the Australian unions that installed Julia Gillard after removing her predecessor, Kevin Rudd, in 2010, have insisted on Canberra maintaining a hardline stance. They have bought the local union narrative of “repressive regime tramping on workers’ rights” lock, stock and barrel. That’s why they’re still trying to deter international visitors from coming to Fiji irrespective of the potential impact on the jobs of ordinary Fijians or the evidence that Fiji’s labour reforms were essential to save crucial state-owned industries like Air Pacific, the national airline. Four political parties formally registered thus far to contest the polls – including all the pre-2006 political entities. The acceptance of offers of international assistance to conduct the poll, including a highly-prized $F30-million donation “without strings” from Papua New Guinea. This week the Australians, the New Zealanders and the Europeans filed into Aiyaz Sayed-Khaiyum’s office to discuss what they might bring to the table. Yet in the case of the Australians, there’s plenty of lingering suspicion about a nation dangling the promise of assistance while doing all it can to derail the Bainimarama Government even at this late stage of the countdown. The disclosure of Australia white-anting Fiji’s ability to raise loans is just the latest in a long line of crash tackles that might have been irritants and even glancing blows yet failed to derail the Bainimarama juggernaut. For a start, how can anyone describe the so-called smart sanctions as anything but dumb when they’ve been so patently capricious and petty, as in the case of the Australian travel bans. Take what happened when Dave Pflieger – the recently departed head of Air Pacific – took one of his planes to Brisbane to visit the airline’s biggest market. This American citizen found himself on the Australian watch list and was turned away and forced to return to Nadi.. Why? Not because he was the head of Air Pacific but because he’d taken the job of Chairman of Tourism Fiji, a Government statutory authority. Air Pacific happens to be 49 per cent owned by Qantas, the “Flying Kangaroo”. Surely – one is entitled to ask – Pflieger was an American working on behalf of an airline almost half- owned by Australia? Didn’t he have a right to visit Australia to pursue the interests of Air Pacific’s Australian shareholders? Yes but that didn’t matter. The Australian action penalised an American citizen, not a Fijian, and contravened every conceivable principle of the right to free trade. In the event, Pflieger turned Air Pacific around, returned it to profit, bought new airplanes and the airline will fly even higher next month as the reborn and rebranded Fiji Airways. But no thanks to Australia. Then there’s Canberra’s repeated attempts to get Fijian troops removed from UN peacekeeping duties. Time and again, Australian diplomats and most notably the former Prime Minister Kevin Rudd, tried to get Fijian soldiers sent home. Blind Freddy – and certainly the UN hierarchy – could see that the attempt was utterly counterproductive. The RFMF has repeatedly proven its metal by keeping order in a string of potential humanitarian disasters, from the Gaza Strip and the Sinai to Lebanon and Iraq. They have been popular on the ground for being the opposite of trigger-happy. Indeed it’s become well known among the citizens of these blighted places that the time to really fear a Fijian soldier is when he puts his weapon down. It’s a sure sign, as he strides purposefully towards you, that a cuffing is in the offing and this has come to be regarded as more fearsome than any bullet. So Fijian peacekeepers are supported by almost everyone. Except, of course, the Aussies and their trans-Tasman clients, the Kiwis. The real point about this attempt to damage Fiji isn’t that it happened but that it failed. Once again, Australia’s impotence has been laid bare. Because not only are Fiji’s existing UN commitments continuing, there’s every sign that they could well be expanded. How will Australia react publicly? Who cares. Certainly no-one in the Fijian Government, where even the mention of Australia nowadays is sometimes enough to trigger a sharp expletive and a rapid change of subject. Which is why Fiji is in no hurry to accept a new Australian High Commissioner in Fiji, no matter how pleasant she might be personally in the case of Margaret Twomey, who presently has her bags packed in Canberra and is sitting there with nowhere to go. The abject failure of a sanctions policy that Canberra and Commodore Bainimarama’s opponents were convinced would eventually bring him to his knees. The abject failure to isolate him internationally. On the contrary, the PM is the current chair of the Melanesian Spearhead Group, chair of the G77 Plus China – the biggest voting bloc at the UN – and chair of the International Sugar Organisation. Under it’s “Look North Policy”, Fiji has also joined the Non Aligned Movement and established diplomatic links for the first time with almost 50 countries. And it’s chaired the United Nations General Assembly. Some isolation. Severe, possibly irreparable, damage to the Pacific Islands Forum, once the preeminent regional organisation but now largely reduced to an Australian, NZ and largely Polynesian club as the Melanesians express their preference for their own organisation – the Melanesian Spearhead Group. Suspending Fiji – the most influential island nation – has been a disaster for the Forum. Not only may Fiji never return, the Pacific island states no longer speak with one voice. Polynesia and Melanesia have been split. Fiji and Papua New Guinea are leading moves to strengthen the MSG, make it the pre-eminent regional grouping and turn its member countries into a common market, with free trade in goods, services and labour. Papua New Guinea is cool on the Pacer Plus trade arrangements with Australia and NZ, saying it would prefer to pursue the MSG option. This too is a stunning break with the past. Fiji’s militant stance against Australian hegemony is beginning to spread to the rest of the MSG, with Papua New Guinea now publically castigating Australia for being high-handed and praising Fiji for its foresight and leadership. So, Senator Carr, who precisely is diminished here? To add insult to injury, the Australian Government looks set to be destroyed in just under four months time at the hands of its own voters. Public support for the Labor Party hovers at around 30 per cent and even many Labor MPs have written it off as a lost cause. So here’s a delicious irony. Voreqe Bainimarama will still be around long after Julia Gillard and Bob Carr are truly diminished – consigned to the history books as perhaps the worse Australian Government since the disastrous “Whitlam Experiment” of the early 1970s. The other day, the Australian unions had the temerity to demand that Fiji be given until September to prove that its elections next year would be free and fair. Why September? Because on September 14th, they too will be history as their ability to influence Australian policy towards Fiji is crushed by Tony Abbott’s juggernaut. The real import of The Australian’s story on the loan veto – conveniently ignored, incidentally, by the Eeyores at the Fiji Times – were some comments from Abbott’s likely Foreign Minister, Julie Bishop. She said that if elected, the Coalition would “review the sanctions against Fiji that remain place to ensure they are meeting their declared goals”. They aren’t so presumably they’ll be modified. And then the sweetest sentence of all. “We would seek to re-engage with Fiji and to help it return to democracy and normalise relations as soon as possible”. Bye-bye Julia and Bob, hello Tony and Julie. For Fiji, the change of government in Australia can’t come soon enough. Readers, anyone who has followed Grubsheet for a long time will recognise the difficulties I am having with the formatting of my recent WordPress postings. My apologies. I used to use lots of photos. Now I’m having trouble posting any at all. The matter is being investigated. Although it has nothing to do with this particular subject, I wonder whether, in the light of the very disturbing news that PNG Police have set upon and cut the Achilles Tendons of up to 74 PNG men who they suspect of criminal behaviour, the NZ Parliament will do the same as it did to Fiji when Prison officers bashed up the two escaped prisoners, and condemn as an act of parliament, this shocking behaviour by PNG Police? The actions and highhandedness by PNG Police in this instance, far out exceeds that of the Fiji Prison Officers and I wonder whether, in the name of fair play, the NZ Parliament will condemn the PNG Police behaviour in the same way they condemned the much lesser Fiji action? I suspect they will not; which will prove beyond all doubt that it was just an exercise in ‘selective outrage’. Yes the Labour Party in Australia will soon be out but the old cronies from the four political parties,pre 2006,are coming back again for a bite of the cherry in September 2014. Is that good for Fiji? Nice piece Graham, I really enjoy reading your articles. Thank you Graham for your truly independent views on this important matter. It is really disturbing that we could have fixed all our roads, our water and electricity supply and our schools with concessionary loans from World Bank and ADB if it wasn’t for the evil interventions of the Australian government. Imagine our roads now without potholes, our water and electricity supply uninterrupted and our hospitals and schools performing to modern standards. But no, the Australian government wielding all its power has prevented this. With a more progressive government taking over very soon, sanctions against Fiji will be removed. Tony Abbott will allow migrant workers from Fiji into Australia, he will facilitate the acquisition of Australian citizenship for Fijians and he will massively increase the aid budget in order to push back on the Chinese influence in the region. With Abbott firmly on his side our PM will win the 2014 elections by a landslide and peace and harmony will be restored in the region. Good article GD! Hopefully we can now get our hands on some good quality vodka! Professor Howes did not supply any evidence for this allegation. But if we keep to what is known the IMF offered Fiji a loan at 3% interest in 2011. This was declined and instead the Dictator held a bond issue with an interest rate of 9%. Both Bainimarama and Khaiyum confirmed the loan had been offered but they declined it. Apparently the strings attached were too onerous for the regime. The IMF had the cheek to ask for transparency on how the loan was used. So this whole Davis rant against the country, of which he has been a citizen longest, is based on unconfirmed rumors. Australia is wise to specify where and how its aid money was spent. Up until the coup most aid money was given to the Government to spend as part of their development programmes. However, since the coup no aid donor is able to verify how its money is being spent and so all the major donors now implement their own projects or use the Forum or other reputable NGOs. No major donors trust Bainimarama with their money. That says a lot more about the dictator than it does about Australia. Giving money to the regime is like putting it in a black hole. We are still waiting for a report from the PM’s Cyclone relief fund in 2011 on how the $40m raised was actually spent. For all we know it just got transferred to the dictator’s bank account in Switzerland or the Caymans. Fiji is just a cheap pawn in the power play in the Pacific. China and Fiji have undoubtedly got closer since the coup. But that has more to do with China being less particular on human rights, democracy or transparency. They don’t mind lending money to Fiji because it means the Fiji Government is employing Chinese workers at the expense of Fijian workers. It also means the benefits of the infrastructure work does not really come to Fiji in terms of the multiplier effect on the economy. China gives the money with one hand and takes back more including interest with the other. Since the increase of Chinese involvement in Fiji has occurred we have seen a massive increase in International Crimes such as Human Trafficking, Drug Transportation etc. in Fiji. Australia and NZ are our true friends. We see it every year with half a million of them visiting our shores annually. They love Fiji. They don’t love the Dictator. You are right Sanctions don’t work. Neither have they worked in Cuba, Iran, North Korea etc. No one expects to change a regime with sanctions alone. But it sure sounds good hearing you and Frank and Aiyaz whining about them regularly. On the contrary, the story has now been confirmed to me independently by another senior international source, who was told by the World Bank TWO YEARS AGO that Fiji had been denied loans through Australian Government pressure. The lack of official denials from within Australia supports this notion, though I notice that someone from the World Bank itself has done so. As Mandy Rice Davies once famously said “well, (they) would do that, wouldn’t they?”. The World Bank is meant to be independent but we now know that this is not the case. And Australian Labor is a shameless, unprincipled government that is about to be consigned to history by the Australian people. As to your bizarre contention that I am somehow dumping on my own country, yes I suppose I am. But I make no apology for it. As you have indicated, I am a dual citizen but don’t regard myself as being obliged to support unprincipled behaviour by one country whose citizenship I hold towards a friendly neighbour whose citizenship I also hold. We are not at war and I will call it as I damn well see it. I regard the current rift between Australia and Fiji as a historical punctuation mark imposed by unelected trade union officials in Australia using their power against the interest of their members by holding an elected government hostage to a policy that is wrong and not in the interests of either country. That is going to end in less than four months time and, as I’ve said, the sooner that happens the better. You are a total disgrace and you are telling lies. The IMF did not offer a 3% loan. The Australian government prevented it as Graham has advised us. Are you saying Graham is lying? Show me the so called statements of our PM and our AG where they decline the loan. It is all nonsense. And don’t forget, that Graham is a truly independent journalist totally committed to tell us the truth and nothing but the truth. very interesting article. Thank you. Whilst I am also not convinced that sanctions are the right strategy to get a country back to democracy, have you considered what detriment Tony Abbott would bring to Australia? He would support the mining industry, remove the CO2 tax, get rid of the climate commission, further endanger the Great Barrier Reef with an even weaker environmental policy, enrage Indonesia with his even worse refugee policy of sending the boats back to Indonesia and I wouldn’t trust him juggling the relations between China, Australia and the U.S. either etc. I can’t see him being the alternative … Talking about China, though, I’d be interested to read more on the growing Chinese influence in Fiji. Barbara, thank you for your praise, but I clearly don’t share your opinions about Tony Abbott. Labor has been a total disaster across a broad front, so much so that Abbott’s winning margin come September could keep him there for a generation. The Abbott era is beginning and, difficult as it is for you to envisage, you can blame Labor for producing a new conservative “golden” age. I thought the mining industry was the only thing keeping Australia afloat – Do you drive a car and use electricity ? I am sorry to tell you this but since you have taken the Qorvis $ to write propaganda for the Fiji Regime you no longer have the credibility to use unnamed sources. Especially in this case where he had the information for 2 years and miraculously told you just when it was needed. Again let’s stick to the facts. We know Bainimarama and Khaiyum turned down the IMF loan. They have said so in statements and they chose to have a bond issue underwritten by ANZ at 3 x the interest. Good deal for Fiji. NOT! To support you claim professor Howes has made allegations but has neither supported it with facts or details. So as I said before your whole rant is based on nothing more than hearsay. Something we would expect from a propagandist but not from a truly independent award winning journalist. I have to laugh at the irony of these 2 statements you made. It takes 2 to tango and for some reason you seem completely blinded by the unelected autocratic military dictator who is running Fiji single handedly. He has a major part to play in this impasse. “there’ve been a few hiccups along the way to restoring parliamentary democracy” I am glad you learnt the art of understate at the hands of the BBC. It is in stark contrast to the rest of your highly exaggerated opinions. As you well know, if the Ghai draft had not been burnt (Do you see how I am using stretching the truth in true Graham Davis style) and if the country was moving towards elections in the way that was originally decreed the smart sanctions would have been eased considerably by now. It is only these backward lurches in the move to democracy that has forced Australia and New Zealand to keep these sanctions. Again, you try to peddle lies against the unshakable truth that Graham is telling. You are also jealous that Graham has this excellent contacts within important institutions such as the World Bank and as all good and truly independent journalists he cannot and should not expose his sources. Myself I have good contacts in the IMF and these contacts have told me that the Julia Gillard has personally intervened when IMF wanted to place a 3% loan in Fiji. There are seven billion reasons why this is a political/ ideological rant rather than one based on facts. I don’t know why you would dispute Stephen Howes. If you go to his website, he has disclosed the loan veto while still maintaining his belief in Australian sanctions against Fiji. So he and I are hardly ideological fellow travellers. You fail to concede that there has been no outright denial of this story from the Australian side. Ergo, it’s true. If you think I would make up the second source just because of a challenge from an anonymous, patently biased, correspondent like you, then go ahead. But I can assure you that the person I am citing exists, is someone of impeccable integrity and is now in a very senior global role. I do not have his permission to out him as a source, irrespective of your taunts. In November 2010 Bainimarama issued the following statement. Fiji has deferred talks for a Stand By Agreement (SBA) with the International Monetary Fund. The decision was revealed to the Fund by Prime Minister Commodore Voreqe Bainimarama in a meeting last week. Government had made a proposal to the IMF for an SBA to stimulate Fiji’s economy. But in a change of tune last week, Bainimarama says the discussions on the SBA are being deferred due to the positive signs in the global economy, the increase in Fiji’s reserves, as well as the increasing confidence in the economy and the need to address specific needs of Fijians. Bainimarama says, while Government is fully aware of the benefits which will come with the SBA, there will be a number of measures which Government and the people of Fiji will need to undertake as is the case with any similar programme. The Prime Minister thanked the IMF for their willingness to work with the Fiji Government adding he wanted the relationship further strengthened. 6 months later Bainimarama borrowed $250m US at an interest rate 3x higher than that offered by the IMF. You must surely agree that in terms of the biggest loan offered by the World Bank through the IMF it was Fiji that turned it down. So perhaps Professor Howes is mistaken or is talking about some as yet not revealed loans. 2010 was before your return to Fiji but the IMF loan and Fiji’s refusal was all the talk in Suva. I remember talking to the diplomats of UK, Australia, NZ and the US. They were all surprised and disappointed by Fiji’s refusal to take up the IMF offer. They to a man or woman all wanted the loan to go through for the reasons that Howes states. So I am not sure what happened less than a year later in 2011 when your source says the very opposite. You don’t need to name names but perhaps you can cite some examples of loans that were turned down. According to the current evidence the outcome of the only loan talks between the IMF and Fiji was ended by Fiji after the IMF had made an offer. Wow. Talk about a red herring of an argument. This has nothing to do with the IMF, or Fiji’s relationship with the IMF. The meat of the story is that the Australian Government lobbied the World Bank and the Asian Development Bank to cut funding to Fiji. That, to me, seems to be the reprehensible act. The fact that they seem to have been at least partially successful is something that the Banks will have to explain. From where I’m sitting – which I admit is outside of Fiji – you seem to have missed the point entirely. Doce you don’t seem to understand simple english! Go to Stephen Howes site! When it comes to unnamed sources, you are much harder on other people than you are on yourself. “You present a very reasonable argument but there is one major flaw. There is interference by the regime in the judiciary. Khaiyum has often stepped in and your paragon, Pryde, has also interfered when he was Solicitor General. There are many instances: Judges, magistrates, court officials, past and present members of DPP, past and present members of FICAC and lawyers can all give examples of the regime interfering in the judiciary. “Chrissie, how on earth is giving general details of the instances you cite going to expose anyone? You don’t even say something like – “well, in the case of such and such this happened…”. You just want the rest of us to take you on trust. As so often Graham what you write is just downright hypocrisy and in this case factually incorrect. Listen Buddy Boy, at least I put my name to my own work rather than hide behind a cloak of anonymity like you. So which bit is factually incorrect? You have gone off on a complete tangent about the IMF. The original story was the contention by Stephen Howes – not denied by Australia – that it secretly used its power to veto loans to Fiji from the World Bank and the Asian Development Bank. In the case of the World Bank, this has since been confirmed to me by someone entirely independent of the ANU. It is you who have introduced the canard of the IMF and what may or may not have happened with it. If all you can do here is try to score political points, then why bother? Take off your mask and dissect my article properly, pointing out precisely those areas that are factually incorrect, and then perhaps we can have a serious discussion. As things stand, it is you who is dispensing propaganda. Graham please delete this nonsense peddled by 7bn. It is outrageous how he tries to discredit you. The next thing he/she will do is to cite a Suva taxi driver who has told him/her that Fiji is a dictatorship. Thank you, Paul, but, unlike the anti-government websites, I don’t delete items except on the grounds of racism, obscenity or gross repetition. Mr/ Ms $7-million may be irritating but they don’t deserve to be silenced simply for questioning or insulting me. Buddy Boy. Thanks Graham I am glad you think I am a youngster. I love the way your cheeks take on a pinkish hue when you get annoyed. I also love your predictability that when you get rattled you always resort to the “at least I put my name to my own work rather than hide behind a cloak of anonymity” Line. Choosing to forget, in this dictatorship you so love, that if I put my name to all I write the boys in green would come a calling. So far you have produced no evidence. You have repeated Howes’ claims that were not backed up by any evidence. You produce an anonymous source out of the hat at just the right moment to back up Howes’ claim. But still there is no evidence. And we know what you think about anonymous sources don’t we Graham. “Give me a break. You’re an intelligent person and what would you say if I did the same?” You just have done the same. My Hypocritical Buddy. Then your final guarantee of the probity of your story is that Australia did not deny it. Weak by propaganda standards, unprintable by journalistic standards. I merely throw into the ring the IMF stuff because they are documentary evidence of Fiji having cordial relations with these types of international organizations. In the absence of any other evidence in the story I thought they might point the readers in a more logical and provable direction than your tirade on your home land. As for me dispensing propaganda, I don’t think so. Point to one disprovable claim I have made. This is an unequal contest between someone with a name and a face (me) and a phantom (you). Haven’t you noticed that the Fijian media nowadays is full of contrarians like you? We have four political parties this far contesting what is billed a free and fair election so the notion that the “men in green” would come for you is risible. Your opinions are just not that contentious. Now, the men in white coats? That’s different. PS.I have just had dinner in Suva with another source who has confirmed the World Bank veto – a senior Australian strategic analyst with a solid reputation in the country’s political, academic and media establishment. So, please, no more unfounded claims that the story is a concoction. It may be an inconvenient truth for the anti-governemnt lobby but there it is. Graham bula vinaka. Please don’t waste your time talking with this ‘ulu kau’ case ($7 bn) who doesn’t seem to get it- all he has to do is read the original article! But some dopes will keep harping even when these nothing to ‘sing’ about. Keep up the good work. Your condescending and patronising attitude is totally unacceptable. How dare you to call Graham “buddy boy”? Lets stick to the facts: A sovereign government has declined to borrow from a multilateral lending agency because too many costly strings were attached to the loan. What sounded like cheap money at 3 % interest would have cost the government millions: The IMF insists in lengthy international tenders for public sector projects while our government has established a quick and effective way to procure large projects such as the Nadarivatu hydro scheme. The project was directly negotiated and approved by the PM without any fuss or delay. As a consequence the lights are still on in Fiji. Then the IMF insisted that the government pays pensions to corrupt politicians such as Qarase. In addition IMF/World Bank always want to meddle in economic policy. They insisted that price controls benefitting the poor would have to go. The ADB on the other hand barged in and wanted to drive privatisation of state owned enterprises when our AG had already drawn up a plan to do so. 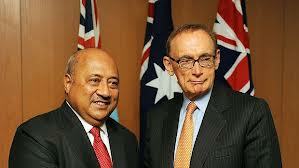 Then the Australian government jumped on the bandwagon and lobbied IMF/World Bank and ADB not to loan to Fiji. But the government has shown that it is truly independent. It raises money from lenders that do not attach cumbersome strings to their loans and enjoys a very close business relationship with China. Paul, to be fair, I started the Buddy Boy routine. No offence meant or taken. I do not believe a change in government in Australia will make any difference at all to policies on Fiji. The bureaucrats run governments, not the politicians. “Mat Sitter” that may well be the case when it’s a centre left government taking the reins of a centre left bureaucracy, as it is whenever Labor and its union backers storm into Canberra. The National Capital is a Labor stronghold. But when it’s a reformist, even radical, conservative government – as Tony Abbott’s will undoubtedly be – then the Foreign Affairs mandarins had better watch out. When John Howard stormed into Canberra after the Hawke-Keating era, he presided over a purge that may well be repeated by his protege, Abbott. Indeed, a significant number of people on the left fear that Abbott is even more conservative than Howard. So the bureaucrats who imagine that they will still dictate policy under the Coalition could be in for a very rude shock. Abbott owes them nothing, unlike Labor, which relies on them for their votes in Canberra -where there are no conservative seats -and their general eagerness to implement a left of centre agenda that suits their own personal preferences. Prepare for the night of the long knives. Why all the surprise and shock? The international agencies are controlled by Western powers and their deputies. We all now that, the UN, the ILO, the WTO and now, the World Bank. Weak, and dishonest all of them. They presume to tell the rest of us what is right and true? Read Arundhati Roy on the chequebook and the missile. Vinaka Robinson that you hit in the head. I am very very worried about our PM wanting to do everything. He is almost on the plane every week its becoming not funny anymore. Could he stay put in Fiji and send his Ministers unless absolutely necessary to go. Who is keeping the books?????###$$$##@@!! !…its really pathetic and sad. For anyone in Fiji it is very very worrying. Why worry? For a long time you guys were spreading the revolution rumor. It didn’t seem to worry the PM at all since he is quite happy to go overseas leaving Fiji to all his Ministers. His laid back attitude should give us confidence that there will be no instability. Unless you want instability, and blood on the floor? You know Aussie politics better than I do. But Howard’s policies on Fiji were similar to Rudd’s. Clark’s were similar to Keys. Maybe this time it will be different. Davis, I have got some information which I wish to send to you. Please tell me where to send it? Please send your contact on my email provided herein. Hooray………………… I am back ol’ matey Graham. About time we showed the door to the Aussie pollies. Their behavior is not funny anymore. Stupid child playing hide & seek. Tony Abbott will certainly change Australian policies towards Fiji. Already he has indicated that immigration into Australia will be facilitated, new arrivals from Fiji will be entitled to social support and a special seasonal workers scheme will be introduced for Fijians. He has also stated that one of his first actions will be the re-establsihement of cooperation between the Australian Defence Force and RFMF. Abbott will also change the entire AusAid programme from project finance to budget aid. Under the new scheme cash will be channeled into the Reserve Bank of Fiji to be distributed at the discretion of the government. I can’t wait until the Gillard gang is kicked out of the office. Please, voters in Australia, vote for a friend of Fiji! Yes its time for Labour to go BUT wait, what will happen to people who have been allowed to hide their faces in Australia by Julia? This is what son of FLP Leader M. P. Chaudhary’s son wrote on his facebook. Now Muslims decide, will you vote for Chaudhary whose own son is a racist? Rajend has written in volumes against Muslims on his facebook, 4.5, and Fiji Today blogs. Haroon, Rajen Chaudhry is a disgrace and with these extraordinary comments, has forfeited his place in mainstream political life. In any event, when he returns to Suva, there is a conga line of people waiting to sue him. So he needs to get used to the unforgiving Australian winter, which is where he has dug his resting place. I am personally aghast that these comments can have been made by anyone in Fiji. Agreed Mr Davis, we have to put an end to such comments. I doubt this two faced ‘man’ will ever be able to return to Fiji. He is the biggest ‘Lamu’ of his time. The fresh newz is that he sold his Lautoka office (Gordon & chaudhary)and his vehicle for FJ$120,000 while sitting in Australia to buy bread for himself. Can We Create A Utopia? What does post-conflict reconstruction look like? Should democracy always be the goal? Or put more simply, is there such a thing as a utopic society? The aftermath of war, be it civil or international, is almost as bad as the fighting itself. Yes, the violence may have stopped – the result of a victorious party, a peace agreement, or an international intervention – but the battle has not yet been won. The conflict is frozen, balancing on the edge of a knife; a sudden movement in either direction could cause the process to unravel. It is at the moment, when a country is most vulnerable, that post-conflict reconstruction begins. The goal is to rebuild the country from the ground up, putting in place the necessary infrastructure and institutions, with all the checks and balances to hopefully ensure that such violent conflict does not reoccur. The traditional formula has been the institutionalization of democracy, but is this the most viable option? Can this create an enduring peace in and of itself? There are two characteristics of democracy that are pertinent to this discussion: competition and choice. Democracy is competitive by its very nature. An election is a competition between competing parties for control of the government. Sounds simple, civil; people go to the ballots, cast their vote, one party wins, and there you have it, a new government. And in a developed democratic system this might be the case, but in a newly formed, or rather forming, democracy, the situation is quite different. Imagine this: the multiple competing fractions in a civil war have managed to come to a peace agreement, by way of an international intervention, have agreed to participate in national elections to determine the next legitimate government. In preparation for these elections, the former conflict fractions each form their own political party. As, resources are scare and corruption is high, the only way to ensure one’s interests is to control the access and distribution of both resources and power. Thus, the elections have become a power struggle between the former competing fractions. In support of this claim, Soth Plai Ngram, an expert on peacebuilding in Cambodia wrote in his M.A. Dissertation, “democracy is a competing terrain for political parties to win their power by controlling military forces, money and resources, rather than by winning the hearts of the people by improving their lives” (p.53). Consequently, rather than foster peace, democracy could actually create another means by which these parties continue to fight, pushing the fragile peace off the edge of the knife and sending it back into the chaos of violence. Democracy is also characterized by choice; the capacity of each individual to have a voice in the process, to make their choice, and to cast their vote. But choices also create differences. They distinguish us from one another. The creation of differences between people, can be the source of future violence is a fragile state if these differences are not addressed or if there are not mechanisms in place for the reconciliation of such difference without resorting to violence. The construction of an identity based on differences is one of the foremost sources of conflict. Take, for example, the Rwanda genocide (rooted in construction of Hutu/Tutsi identities), the Israeli/Palestinian conflict (rooted in different religious identities), or the conflict between the two Sudans (rooted in a conflict between Arab/African identities). Democracy helps to facilitate the capacity of choice, but could it be possible for this capability to actually be detrimental to post-conflict reconstruction? How do we reconcile this? If not by democracy, then what? The community in the giver is supposed to amply a utopic society; however, it is anything but a democracy and is rather more akin to a dictatorship. There is no suffering or pain, no bloodshed or tear, but there also is not choice or freedom. The society has a prescribed set of rules to which its citizen must adhere and the citizens are constantly monitored by camera to ensure compliance. The society has a predetermined number of births and deaths (referred to as ‘releases’) per year and each family unit has two children (one male and one female). A Committee of Elders matches husbands and wives, children to their parents, and jobs to the children at the age of 12 based on their individual characteristics and personal attributes. There are not differences. There is no colour, only shades of grey, emotions are suppressed with medicine, and there is an emphasis on uniformity and conformity. This system is functional and it seems to works, at least in the short term. The problem here is that it is like a teeter-totter; it can be a stepping-stone to something greater or a system needing just the right straw to entirely collapse. So where does this leave us in terms of post-conflict reconstruction. What I have just described represents the two chasms between which peace balances: democracy, by nature of choice and competition, resulting in reoccurring conflict at one extreme, and dictatorship resulting in conflict when its authority is shaken or threatened at the other extreme. And in between we have a peace, fragile and fleeting, but nevertheless struggling to exist. The goal of post-conflict reconstruction should be neither democracy nor dictatorship, but rather the expansion of the space in which peace can be created; a widening of the tightrope to a more manageable size. It should begin with dialogue among the parties involved, but should not move too quickly towards any particular goal. A strong foundation needs to be built otherwise the system will collapse once more. If democracy is the answer, then the progress towards it needs to be slow. It needs to be built up brick by brick, not thrown together with fingers crossed hoping that it works. A democracy in a post-conflict situation needs to be continuous supported – one election does not create a democracy. It is a process. It may come with initial elements of dictatorship – highly centralized power, lacking in rights and freedoms – but these elements do not spring up overnight. Yes, the ultimate goal should be an open, democratic society, but this takes time. So, can we create a utopia? Is a post-conflict situation the opportunity to sculpt a utopia society? Probably not. But that doesn’t mean we shouldn’t strive towards it. If we are taking utopia to be synonymous with peace, reconciliation, the absence of violence, human rights, sustainable development, and the dignity of human beings, then it is a goal that we must continue to work towards. However, it is a project that never ends. There is no perfect system, no perfect democracy, no perfect society; it can constantly be improved. Although utopia will never be reached, striving towards it is what helps to create a lasting peace, one step at a time. The reality is that, the model of Western democracy which most nations aspire to, is morphing in to a Dystopia, which the NSA/PRISM episode reveals bare to the world. This Dystopian group of nations, which Australia and New Zealand are a part of, have been invading other nations (mostly 3rd world countries) to bring democracy and plunder their resources, also spy on their own citizens and other nations. This group of nations preach these ideals and lecture other nations on these ideals. yet they themselves have gone to great lengths to undermine civil liberties which are the corner stones of centuries of democractic governments- or so we are led to believe. Can some one tell this ‘kutta ke pilla’ that She is respected as Madam by people who respect her. How can this ‘mangoes’ forget that he also used to call her and bow before her when he ‘USED’ to be a lawyer. Does Labour leader Mahendra Chaudhry agree with his Sydney-based son and onetime political heir apparent’s embarrassing attacks on one faith? We were under the impression that Labour was promoting multiculturalism. Is the suspended Suva lawyer still in “The Master’s” party? Amazing article, full or raw truth in the most unbiased fashion. I would also add (since I’m writing long after the initial posting), and post Australian elections, that it appears that PM Frank could well be on his way to being the democratically elected leader now ! As a Fijian, my biggest concern is not so much with our internal struggles, but the massive collapse in judgement by the Labour government in Australia. They have let down Australia and the entire Pacific defence shield. I don’t know how to put this any better, but which idiot gets so upset at Fiji…we’re talking a south pacific nation Fiji, that it would allow China on its doorsteps ? It’s a horrible case of 2 estranged brethren being taken advantage of by an opportunistic monster, simple because the older brother was ruled by labour’s ego. Truly, a needless travesty !